"I am not a Pig! - I'm a Javelina"
The open Sonoran Desert surrounding Casa Campana and neighboring properties is the perfect habitat for Javelinas. For the title of this blog post, I stole from one of our favorite Tucson attractions, The Sonoran Desert Museum. While it is a museum, it is also a lot like a zoo for native animals, including Javelinas. The sign that greets patrons at the Javelina sanctuary says, “We’re not Pigs!”. I liked that so much, I decided to re-use it. It’s as if a Javelina would be insulted if you called it a pig to its face! To be specific, a Javelina is most definitely not a pig though. They actually come from the Peccary family which is a species of hoofed mammals originating from South America. Today they also live around the Sonoran Desert area of Southern Arizona. They travel in herds using the desert’s natural washes as pathways. They eat vegetation and grubs mostly and can weigh up to 40 pounds and grow up to 19 inches tall. Google “Javelina” and you will get an abundance of links to research. The Arizona Game & Fish site has a particularly good summary, including safety precautions. But don’t worry, if you are out for a walk, or look over the back wall and see the Javelinas of Casa Campana, just enjoy the experience and keep back a safe distance. Last fall during our own family vacation at Casa Campana, we spotted the herd just off the far driveway loop. What started as a sighting of the backside of a single Javelina, turned out to be the whole herd of about ten javelinas, big and small. 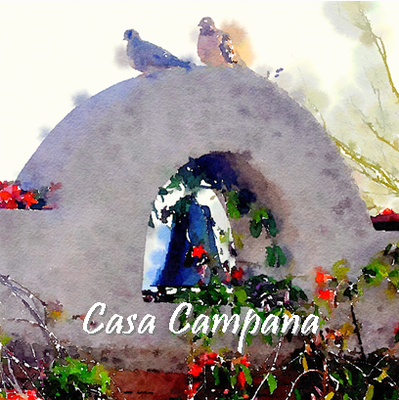 If you are able to visit Casa Campana, we hope the javelinas will pay you a visit. Just don’t call them "Pigs" within their ear shot!